Landscape Design in a Day’s newly installed RTF grass with dry stream bed. This is the year for rethinking the lawn. As a Portland landscape designer many of my new clients want to make big changes in their landscapes. I am recommending clients replace their old lawns with new and improved grass varieties. My Lake Oswego clients, George and Marcia, contacted me completely discouraged about their front yard. I met them in the fall after our particularly hot and horrid summer of 2015. They had spent their entire summer watering and watering their lawn. It wasn’t dead on the October day that I came to their home but as you can see it was quite unattractive. They decided it was time to hire a designer and start over with their landscape. It is a typical Lake Oswego landscape with heavy clay soil, fir trees nearby with thirsty roots, and drainage problems. 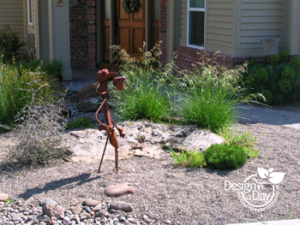 Before we even started the landscape design process, I was able to share information about a new lawn grass that uses less water and is more durable than the grass (perennial rye grass blends) we have been using for the last 30 years. Working closely with Kevin Schindler of Autumn Leaf Landscaping Inc. we replaced their old lawn with Rhizomatous Tall Fescue (RTF) grass and designed a naturalistic dry stream bed that also solves the drainage problems. Solving the drainage problems also enhances the health of the grass. Even RTF grass doesn’t do well in a boggy winter soil. George and Marcia are very pleased with the appearance and performance of the new grass. They love their new dry stream bed and how it has pulled together the entire front yard, giving it a dramatic focal point. Installation day at George and Marcia’s Lake Oswego home. This year several of my clients have taken out their old grass and installed RTF. From a distance it looks like any lawn, in fact it looks more uniform because it grows so thickly that it tends to crowd out weed grasses much better than our perennial rye grass does. My Lake Oswego clients especially appreciate the fact that RTF tolerates more sun and heat and if they did decide to let it go dormant, it will come back beautifully. RTF can even handle a south facing lawn with reflected heat from a sidewalk. This is the most difficult place to successfully grow grass so Portland landscape professionals are embracing this new product. Other clients want no lawn designs, thinking it will be lower maintenance. No lawn will mean lower water usage but replacing a lawn with paths and plants does not promise low maintenance. Even the fairly new minimalist style using 90% round river rock and 10% plants isn’t as low maintenance as you think. Someone has to blow dust and debris out of the river rock frequently to prevent weeds from building up. Many clients simply don’t want to mow any lawn and are fine with the first two years of extensive weeding that is needed to get a no lawn front yard established. For a lot of people, however, weeding is the least favorite gardening chore. Other clients are installing synthetic lawn. 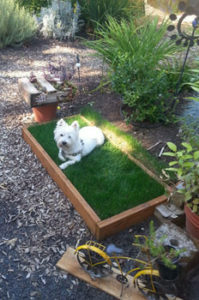 Before you sneer at the idea of fake grass (which I did when I first heard about it), check out these photos of my Southeast Portland clients Bob and Norma Bleid. They gave themselves a retirement gift, front and back synthetic lawn. 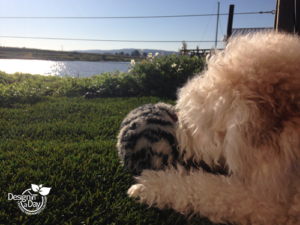 No water, no chemicals, no fertilizer; it is the ultimate low maintenance landscape lawn. Early fall is a particularly good time to install a new lawn or landscape. With a good irrigation system landscapes can be installed any time of the year. As a Portland landscape designer I am not fond of July or August installations, I know my clients will be “nervous nellys” seeing their plants’ leaves droop, scorch and burn in the summer sun. The fall rains typically do a beautiful job of providing the moisture needed to get plants (including grass) well established. 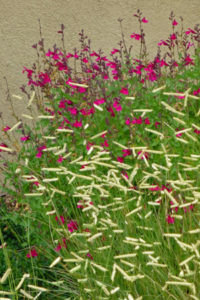 This eliminates the stress and worry of summer planting. Delightful patio replaces stodgy deck – notice the beautiful synthetic lawn. Garden Consultation – Margaret hired me as a garden coach. We worked together for several years. Her property in Lake Oswego has typical problems; clay soil, greedy tree roots, soggy lawn with moss and drainage problems. But in my mind, the biggest problem was a deck that had been built by the previous owners. The shape was boxy and didn’t fit Margaret’s colorful NW natural garden. 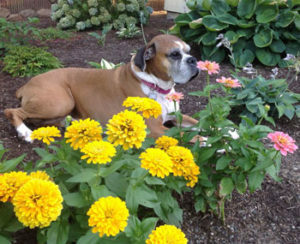 For 6 years our garden coaching focused on her garden plantings. My client is hands on and did her own maintenance for her large property. In fact, one time, the contractor was late and we just couldn’t wait for him….and I might add we were a lot younger…..so Margaret and I decided to plant these 5′ tall Arborvitae up on the hill ourselves. Things were going well until one rolled down the hill and took me out like a bowling pin. The old deck had to go! At last she was ready to have the garden of her dreams. How delightful it would be to play with her plants instead of mowing. She was tired of fighting with fir tree roots, shade and clay. Her lawn was never dry until August, when it was then parched and it never looked good. She wanted to spend her time gardening, not doing basic maintenance. There is nothing worse than spending your time cleaning up a landscape that you don’t like the looks of. She didn’t want that deck any more. 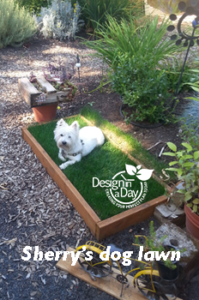 She wanted a NW natural design that would include two sitting areas (one a new patio off the house to replace the deck, a flagstone patio in the woods) and synthetic lawn for her and her dogs. We also re-worked her garden paths so they would be easier to clean up and look so attractive they would integrate the landscape. The new stairs are complemented by easy care synthetic lawn. The new design also met the horticultural needs of the fir trees since synthetic lawn doesn’t need summer water and our native fir trees are healthier without summer watering. Now Margaret can blow or even use a dry vac on her lawn to remove fir needles. It looks good all the time and the dogs are very happy and clean. It is also a lot easier to clean up dog poop! Old garden path was hard to navigate and had no drama. We worked together to create the design. Because of the scope of the job Margaret choose to hire a professional, Autumn Leaf Landscaping. It is an amazing transformation. Margaret’s plants and garden look fabulous because the supporting structures are well shaped and attractive.